The high-profile tenants of Hall 1.0 and 1.1 at BaselWorld 2014 didn’t disappoint the first day of this largest of the annual watch and jewelry shows, where nearly all the major timepiece makers show their latest models to the world. Followers of International Watch’s website and social media have seen reports of Patek Philippe’s two steel debuts, the Nautilus Travel Time Chronograph (Réf. 5990) its first timepiece to combine a dual time zone with a chronograph, and the Annual Calendar Chronograph (Reference 5960/1A), the latter one of the very few Patek Philippe timepieces in steel outside its sports watch collections. Those awaiting word on special 175th anniversary pieces will have to wait until later in the year as the brand plans a second major release in October in Geneva. While many brands extend existing collections with new dials, new case shapes and additional gemstones, others have been spending the past year or more doing research and development under their dials to create movements with new technical attractions like longer power reserves, better friction coefficients and even entirely novel methods of transmitting power to their watch hands, moonphase discs and dates. Ulysse Nardin, a pioneer in using silicon caliber components, debuts an entirely new silicon escapement called the Ulysse Anchor Escapement that creates, for the first time, a flying anchor, eliminating the need for a pallet staff and its accompanying friction. Ulysse Nardin CEO Patrik Hoffmann showed iW a test model he’s been wearing with the new escapement and, touting its accuracy, foresees the new escapement in a new watch for next year’s Basel. Also in-house is the firm’s Dual Time Manufacture model, with new in-house caliber UN-334. This edition will replace the former model to further edge this solid independent company to its near-term of reaching sixty percent of its models equipped with internally made movements. Another solid independent brand, Oris, is celebrating its 110th anniversary by presenting a new caliber entirely developed in-house, the brand’s first in more than three-and-a-half decades. The manual movement features an impressive ten-day power reserve as is indicated on the dial’s patented non-linear counter. Oris says these two complications have never previously been associated. For its ladies models Rolex has unveiled new Caliber 2236 featuring a Syloxi hairspring made from silicon and developed in-house. With five new patents, the automatic kicks off a new generation of movements for the brand’s women’s models. Down the hall at Omega, the brand’s new Master Co-Axial calibers now extends its extremely anti-magnetic 15,000 Gauss debuts into more of the company’s models. Next door at Tissot, the brand’s new Tissot T-Touch Solar is the first watch to present a touch-screen powered by solar energy. At Maurice Lacroix, the firm’s Masterpiece Gravity features added its first in-house silicon balance roller, lever and escapement wheel, all seen clearly from the gorgeous domed sapphire crystal that covers its dial. 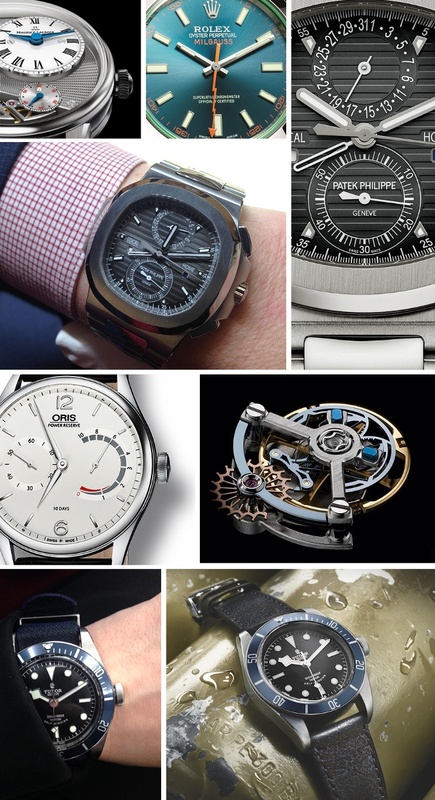 As the second day of BaselWorld begins, stayed tuned to iwmagazine.com and our Twitter and Instagram feeds to discover more of about new debuts, including news from TAG Heuer, Girard-Perregaux, Seiko, Dior, Bulova and many others.